We all have an internal battle from time to time, sometimes between our heart and our heads. Some people struggle even more with their duality, the opposing parts of themselves which seem to contradict and leave this person feeling confused and more than a little bit torn. For some times this is something they fact constantly and it can be truly overwhelming, for others it seems easier to figure out the balance. 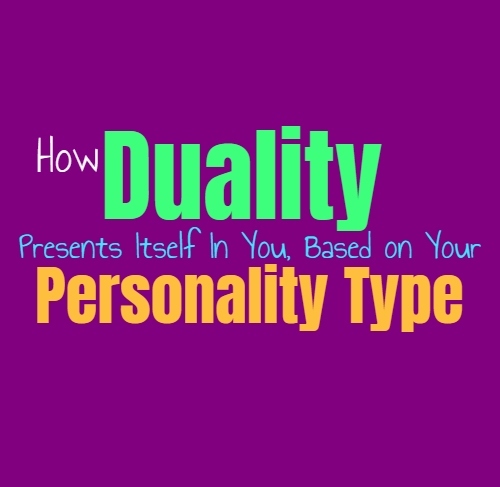 Here is how duality presents itself in you, based on your personality type. INFJs struggle with duality constantly, possibly more than any other personality type. They find themselves constantly at odds internally, struggling between the dueling aspects of their personality. INFJs are often seen as contradictory in nature, and find it difficult to feel understood because of this. People rarely understand how they can have views and behaviors which seem to contradict in the way they do, and so it makes them misunderstood. INFJs definitely feel this battle constantly, but the duality within them is what makes the INFJ so unique. They can see things that others cannot, and understand different angles of a situation where people might become stubborn and really miss the depth there. ENFJs do struggle with the duality in their nature, not always sure which road to follow. They follow bot their heart and their head, as well as utilize their intuition. They struggle to maintain this balance and are always trying their best to hide this from others. ENFJs want to be sure to follow their heart, which often tells them to care for the emotions and well-being of others. At the same time they believe in getting things done and want to be sure they are being efficient and smart with their choices. This battle can be difficult for the ENFJ, but they do their best to find the right balance, and often for them it leans more towards the needs of others. INFPs definitely struggle with a sense of duality within themselves, but they have much more of a drawing to their emotions. While INFPs do find themselves battling between opposing internal views and thoughts, they are often lead by their morals. INFPs develop rather strong inner morals as they grow and become more confident in themselves, and these morals can be quite the beacon and guide for them in life. They find themselves naturally gravitating towards these things, and work hard to maintain the balance where they can. ENFPs feel a sense of duality in the way they think versus the way they feel. They are creative people who enjoy exploring many different paths and ideas, and this can sometimes be at odds with their internal set of morals.The ENFP finds themselves searching for new things, and wanting to consider their options even if those options might not be the ones they are happiest with in the end. They don’t like feeling closed off to these things, but sometimes this curiosity leads them down paths which their morals start to oppose. INTJs do feel a surprising sense of duality within themselves, battling within their rich inner minds. For the INTJ there is often so much going on inside of them, and they find themselves rejecting certain details in order to focus on facts and what is the most logical choice to make. Sometimes this causes them to oppose their morals in some ways, which is not something the INTJ feels completely comfortable with. Deciding between what is morally right and what is logically sensible, is often the biggest duality struggle for the INTJ. They are often faced with this battle, but most people are not fully aware that they have this going on inside of them. ENTJs are very focused and efficient people, but they certainly deal with opposing feelings and points of view within themselves. Their duality presents itself by causing the ENTJ to struggle between what they believe is morally right, and what they believe is the smartest path to take. Sometimes the most logical and practical choice can be at odds with what they find morally sound. The ENTJ finds themselves wanting to create balance between these two things, but this can be a constant struggle for them. INTPs certainly endure plenty of confusing within themselves, but their duality is often between their heart and their head. While INTPs might not be in tune with their emotions, they still experience them on a deep level. They find themselves torn away from what is logical sometimes, simply because their heart is advising them in a different direction. This can be something which confuses the INTP, and so they attempt to bury these feelings in favor of what is logical. Regardless, they still find themselves struggling with this and are always at odds with themselves in some ways. ENTPs are curious and enthusiastic people, who are always eager to explore something new. Their curious nature does sometimes put them at odds with themselves, especially when it comes to their occasional desire for stability. ENTPs want to explore new and exciting information, but they also find themselves being pulled by their heart sometimes. ENTPs do want to find connections and care about finding someone to share their lives with. This is something they can often battle with, their logical minds and passionate hearts often at odds. ISTJs are often great at maintaining balance and find ways to battle against any internal sense of duality they might experience. They are focused people who know how to go after their goals, without allowing anything to stand in their way. While some types might doubt their choices or be confused with their inner emotions, ISTJs are good at finding the path directly towards what they want from life. One of the gifts is this ability to figure out their goals, and become unafraid to go after them. ISTJs do sometimes struggle with their moral beliefs and their desire for efficiency, but they find a way to maintain this balance. ESTJs are very driven and focused people, and so they believe in working hard to accomplish their goals. While everyone does experience a sense of duality within themselves, ESTJs are often great at finding this balance. They are more focused on efficiency, and this desire to get things done is something which helps them find the path they seek most. For the ESTJs duality is not quite as much of an issue as it might be for some other types. They know what they want from life and will do anything it takes to acquire this. ISFJs do battle with their sense of duality, which is tied to their desire to care for those around them. ISFJs battle with knowing what is right for others, versus what these people might want from them. They care about helping others and focus on trying to always be there for their loved ones. While ISFJs focus on tending to the emotions of those around them, they are also very practical minded people and this is something which can cause them to feel an internal struggle between what they should do, and what their loved ones want from them. ESFJs are compassionate people, but they certainly struggle with what is inside their hearts versus their heads. They want to be practical about things, but at the same time they want to help their loved ones in any way possible. They care about the emotions of others, and this can often cause them to be at odds with their choices. The ESFJ might see the most practical choice in front of them, but this might upset someone they love. They don’t often struggle with duality internally, instead it is a battle between the needs of others and the more practical decision. ISTPs are often more focused on enjoying the moment than anything else, and so this helps them to forgo this inner battle others might face. Instead of fighting with themselves they simply go for whatever is exciting and inspires them most in the moment. They are eager to experience new things and just grab life with everything they’ve got. For ISTPs it is best to let go of those doubts and so they don’t want to struggle with a constant internal battle. ESTPs sense of duality presents itself in their connection to their emotions, versus their desire to be logical. They follow facts and evidence which is tangible, but at the same time they feel deeply for their loved ones. ESTPs want to please the people around them, but sometimes this puts them at war with their own minds. ESTPs try their best to find a balance in this situation, but it can certainly be a struggle for them. ISFPs struggle less with duality in their lives, since they always seek to follow their hearts. ISFPs go wherever their feelings lead them, and believe in living their lives in the present. They don’t want to focus on doubting themselves, since this holds them back from leading the life they believe they were meant to. ISFPs do sometimes feel a sense of duality when they look to their desire to please others, versus their desire to please themselves. ESFPs are vibrant souls who focus on living in the moment and just want to enjoy their lives. They seek out whatever pleases them and excites them most, and so they have a way of finding balance where it is important. ESFPs often struggle less with this war of duality within themselves, since they follow their hearts no matter what. This helps them to find the path they want, because they don’t believe in overthinking it.